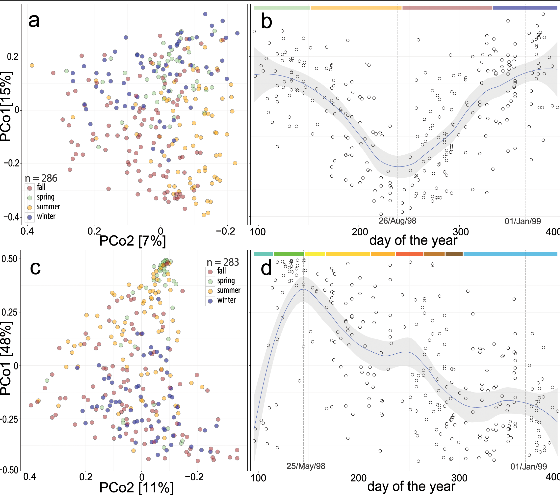 (…) we wanted to identify key environmental determinants for the house dust microbiome from an existing collection of spatially (area of Munich, Germany) and temporally (301 days) distributed samples and to determine changes in the community as a function of time. 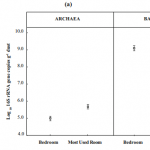 To that end, dust samples that had been collected once from the living room floors of 286 individual households, were profiled for fungal and bacterial community variation and diversity using microbial fingerprinting techniques. 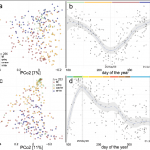 (…) We inferred that fungal communities in indoor dust changed semi-annually, whereas bacterial communities paralleled outdoor plant phenological periods. 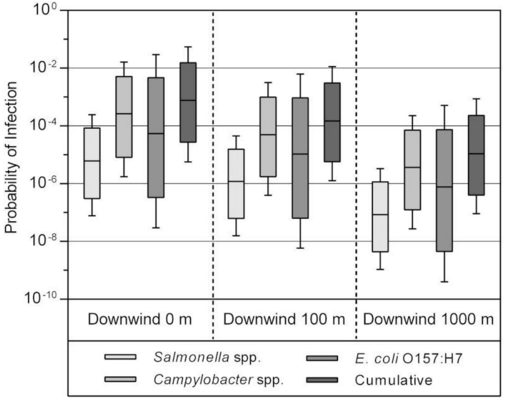 These differences in temporal dynamics cannot be fully explained and should be further investigated in future studies on indoor microbiomes. 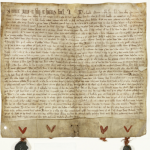 (…) Here, a qualitative analysis was conducted, based on genetic identification of bacteria and fungi present on the document as well as denaturing gradient gel electrophoresis profiling and examining the destructive potential of isolated microbes. Moreover, the study involved a quantitative and qualitative microbiological assessment of the indoor air in the room where the parchment was kept. The microbes with the highest destructive potential that were isolated from the investigated item were Bacillus cereus and Acinetobacter lwoffii bacteria and Penicillium chrysogenum, Chaetomium globosum, and Trichoderma longibrachiatum fungi. The presence of the B. cereus strain was particularly interesting since, under appropriate conditions, it leads to complete parchment degradation within several days. Bulking and foaming are two notorious problems in activated sludge wastewater treatment plants (WWTPs), which are mainly associated with the excessive growth of bulking and foaming bacteria (BFB). 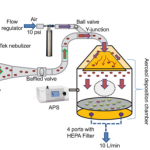 However, studies on affecting factors of BFB in full-scale WWTPs are still limited. 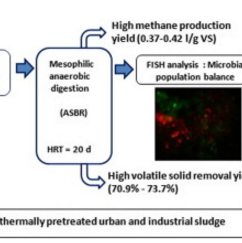 In this study, data sets of high-throughput sequencing (HTS) of 16S V3—V4 amplicons of 58 monthly activated sludge samples from a municipal WWTP was re-analyzed to investigate the BFB dynamics and further to study the determinative factors. (…) Bacteria species correlated with BFB could be clustered into two negatively related modules. Moreover, with intensive time series sampling, the dominant BFB could be accurately modeled with environmental interaction network, i.e. 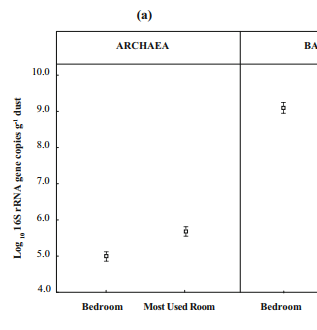 environmental parameters and biotic interactions between BFB and related bacteria, indicating that abiotic and biotic factors were both crucial to the dynamics of BFB. The effect of thermal pre-treatment on the microbial populations balance and biogas production was studied during anaerobic digestion of waste activated sludge (WAS) coming from urban (US: urban sludge) and industrial (IS: industrial sludge) wastewater treatment plants (WWTP). (…) Fluorescent in situ hybridization (FISH) was used to quantify the major Bacteria and Archaea groups. 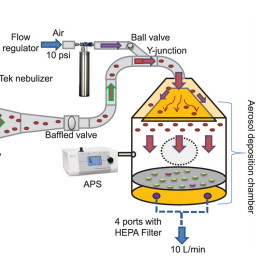 Compared to control trails without pretreatment, Archaea content increased from 34% to 86% and from 46% to 83% for pretreated IS and US, respectively. 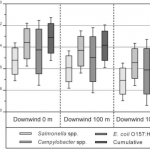 (…) Therefore, the stable and better performance of digesters was observed involving the balance and syntrophic associations between the different microbial populations. 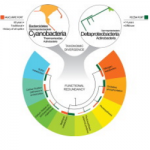 (…) Many factors such as changing environmental conditions or substrate variations can influence the composition and biodegradation capabilities of syntrophic microbial communities in hydrocarbon-impacted environments. In this study, a methanogenic crude oil-degrading enrichment culture was successively transferred onto the single long chain fatty acids palmitate or stearate followed by their parent alkanes, hexadecane or octadecane, respectively, in order to assess the impact of different substrates on microbial community composition and retention of hydrocarbon biodegradation genes. 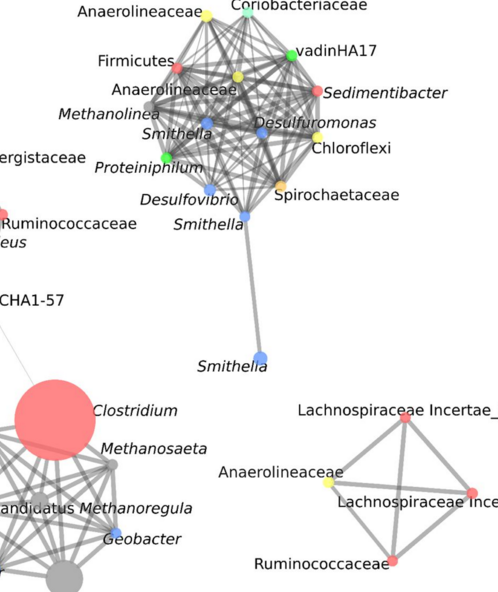 (…) Our results reveal the effect of substrate diversity loss on microbial community diversity, indicate that many syntrophic interactions are stable over time despite changes in substrate pressure, and show that syntrophic interactions amongst bacteria themselves are as important as interactions between bacteria and methanogens in complex methanogenic communities. Production of both livestock and food crops are central priorities of agriculture; however, food safety concerns arise where these practices intersect. In this study, we investigated the public health risks associated with potential bioaerosol deposition to crops grown in the vicinity of manure application sites. A field sampling campaign at dairy manure application sites supported the emission, transport, and deposition modeling of bioaerosols emitted from these lands following application activities. 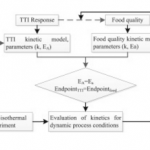 Results were coupled with a quantitative microbial risk assessment model to estimate the infection risk due to consumption of leafy green vegetable crops grown at various distances downwind from the application area. (…) Median risk was below 1:10,000 at >160 m downwind. As such, it is recommended that a 160-m setback distance is provided between manure application and nearby leafy green crop production. Additional distance or delay before harvest will provide further protection of public health. Maritime ports are anthropogenic interventions capable of causing serious alterations in coastal ecosystems. In this study, we examined the benthic microbial diversity and community structure under the influence of two maritime ports, Mucuripe (MUC) and PecÃ©m (PEC), at Equatorial Atlantic Ocean in Northeast Brazil. Those seaports differ in architecture, time of functioning, cargo handling and contamination. 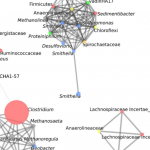 The microbiomes from MUC and PEC were also compared in silico to 11 other globally distributed marine microbiomes. The comparative analysis of operational taxonomic units (OTUs) retrieved by PCR-DGGE showed that MUC presents greater richness and Î² diversity of Bacteria and Archaea than PEC. In line with these results, metagenomic analysis showed that MUC and PEC benthic microbial communities share the main common bacterial phyla found in coastal environments, although can be distinguish by greater abundance of Cyanobacteria in MUC and Deltaproteobacteria in PEC. (…) Our results suggest that multiple physical and chemical factors acting on sediments as a result of at least 60 years of port operation play a role in shaping the benthic microbial communities at taxonomic level, but not at functional level. 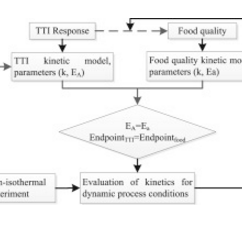 Compared to other available non-microbial TTIs, the distinct advantage of microbial TTI is that its response (color change) is a result of a process (the growth and metabolic activity of the TTI microorganism) simulating the actual quality loss process (the bacterial growth and metabolism of the “specific spoilage organisms”) of many foods, especially most chilled high-protein foods. 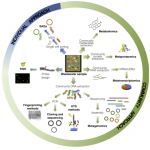 (…) The article puts forward five development trends of microbial TTIs: The microbial TTIs with microencapsulation of microorganisms and two separate compartments could keep microorganisms stable and allow for room temperature storage; The TTIs integrated with RFID and bar code technologies could identify and transmit the color message of TTIs automatically and systematically; The microbial TTIs could be fabricated by a simplified method; The sensitive TTIs to different microbial metabolites are valuable complementarity for microbial TTIs application; The available open shared TTI kinetic parameters database and shelf life prediction models could facilitate the microbial TTIs application.